Your ATV needs a wider wheelbase for jumping and cornering stability. Maybe you've even considered adding larger wheels without lifting your bike. We offer hand tested, commercially packed ATV wheel spacers with a proven design to withstand more weight, torque and force. 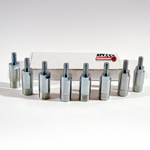 ATV Engineering also offers both stud AND disc spacers. Your satisfaction is GUARANTEED with our lifetime warranty so why settle for expensive axles and arms for widening? ATV wheel spacers are your answer! Buy and ride with confidence from ATVEngineeringParts.com! 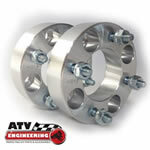 Our wheel spacers cover the most popular ATV's. These include Honda TRX and EX models, Yamaha Raptor, Kawasaki KFX models, Suzuki KingQuad and QuadSport, Polaris, ....you name it, we have ATV wheel spacers for it and a lifetime warranty! We even have wheel spacers for golf carts including EZ-Go, Yamaha and Harley Davidson. If you still need even MORE clearance between those new tires and your bike's fenders, an ATV lift kit could be the answer you've been searching for. 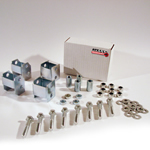 Our ATV lift kits are very easy to install, and made from high-tensile, hot rolled steel. This is the same steel strength as the brackets welded to your ATV frame. Don't settle for weaker, A36 standard metals! Better yet, our lift kits are American made, don't require drilling or welding, and are zinc plated like the hardware on your ATV. Shock brackets are powder coated black for superior protection. Just like our wheel spacers, your satisfaction is guaranteed with a lifetime warranty on our lift kits. We cover a wide array of popular ATV model lift kits including Honda Rincon, Recon, Rancher and Foreman, Suzuki KingQuad and even E-Z-GO Golf Carts! Racing a quad or riding a Harley? We've got you covered when it comes to lowering your bike. 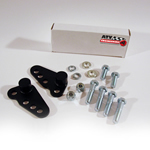 Our ATV lowering kits offer a practical, durable way to lower your center of gravity when taking corners in flat track racing, ice racing, supermoto or every day riding. Our quad lowering kits cover Yamaha Raptor, Honda TRX and EX, even Yamaha Banshee and Warrior models. How about that Low Rider? Our rigid struts fit a wide range of Harley bikes and will lower your bike up to 4 inches...no clearance issues! Each strut is precision manufactured in the USA. Our lowering kits cover Road Glide, Electra Glide, Street Glide, Ultra Glide, Road King, Touring, Sportster, Dyna Fat Bob, Dyna Street Bob, Dyna Wide Glide and Low Rider. ATV Engineering is a wholesale ATV parts and accessories provider specializing in ATV wheel spacers, lowering kits, and lift kits for most any model and brand of ATV. Our high quality kits and wheel spacers cover manufacturers including Honda, Yamaha, Kawasaki, Suzuki, Can Am, Polaris, Kasea, Red Cat, Eton, and Kymco ATV's. Our products are the absolute lowest price and the highest quality steel! Check back often....we are constantly updating an ever growing selection of ATV parts and accessories for your bike. Shipping Information: All orders will be shipped Priority Mail within 2-3 days of ordering.